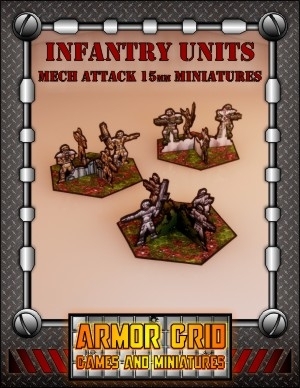 15mm Infantry Units for use in Armor Grid: Mech Attack or any other 15mm Sci-fi Wargame are now available for FREE! 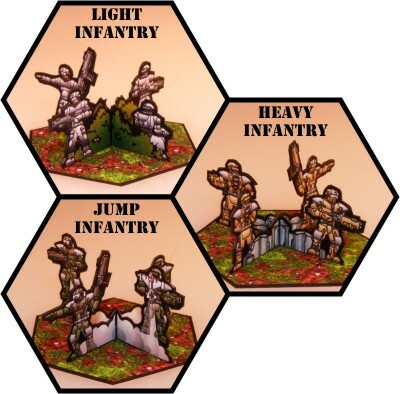 This set includes Light Infantry, Heavy Infantry, and Jump Infantry Units based on 40mm hex bases. Each unit is supplied in Urban Gray, Forest Green, Dessert Tan, and Uncolored (for your customization). All Armor Grid Miniatures are rendered in 300dpi for high quality printing. They are all designed with complete front and back images to more closely represent more traditional gaming miniatures. All miniatures are provided with easy to follow directions and multiple basing options.